Republic Heritage - Latest in Political News! : CNN DEBATE TONIGHT! CNN LIVE: Tune in Wednesday at 8 p.m. ET for the last presidential debate before Super Tuesday, the CNN/Arizona Republican Party Debate hosted by John King. 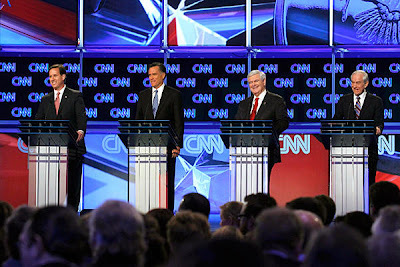 Mesa, Arizona (CNN) -- It's been 26 days since the candidates left the stage at the last CNN debate in Jacksonville, Florida, and the growling hunger pangs of the media have grown louder even as the candidates grow weary. There have been 19 Republican presidential debates so far, and while some may have debate fatigue -- including a few candidates -- the forums have nevertheless proved to be illuminating experiences. They have garnered sky-high TV ratings and have become "event" television. They have helped to define several candidates while others fall from grace in front of the live cameras. But for many voters, it has been the debates -- especially those that have preceded a primary or caucuses -- that have become the deciding factor when they choose who they want as the GOP nominee. They have provided a window into each would-be nominee, and offered insights into how they act under pressure. According to exit polls, many voters make up their minds after watching a debate.